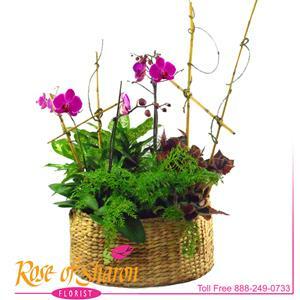 We have chosen a large, honey colored basket to fill with a collection of tropical plants and phaleonopsis orchids. The bamboo and vine evoke a jungle feeling. This is a very large garden with can be kept and grown as is or the individually potted plants can be removed for use.